Living on the edge of Ilkley Moor you have just got to love the fells. A lot of our coaches and helpers are fell runners so we are familiar with the local fell scene. Kim Anderson has written this brilliant piece about fell running, and why everyone should have a go. Read it here. We encourage participation in local fell races and we organise junior races at our own Ilkley Moor fell race in February. Since 2005 we have presented Phil Dean memorial awards to the first boy and girl Junior Ilkley Harrier finisher in the U10 (U11), U12 (U13), U14 (U15) and U16 (U17) age category (presented at the end of March at the annual junior presentation evening). And in 2012 we introduced a Junior Fell League. Geoff Thompson of Wharfedale Harriers coordinates the Bradford Athletics Network (BAN) Fell &Terrain League. Further details of the 2019 League and league tables can be found on the BAN Junior Fell League website. The league is open to juniors of BAN affiliated clubs. Eight different race categories - U11 (min age 8), U13, U15 and U17 (boys & girls). League points are awarded at each event and at the end of the series awards will be presented to the first 3 finishers providing a minimum number of races have been run. The 2016 Final BAN Fell & Terrain League Tables. The 2015 final BAN Fell & Terrain League Tables. The 2014 final BAN Fell & Terrain League Tables. The 2013 final BAN Fell & Terrain League Tables. The 2012 final BAN Fell & Terrain League Tables. The 2011 final BAN Fell & Terrain League Tables. The 2010 final BAN Fell & Terrain League Tables. 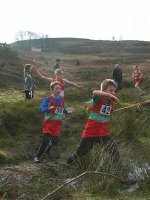 We also encourage Junior Harriers to compete in the BOFRA Fell Championship races which take place in the summer months between May and September. These are for U9 (non championship), U12 (minimum age 9 years), U14 & U17. Full details regarding the series format, BOFRA membership and races is on www.bofra.co.uk.